In residential areas, Squirrels travel power lines and short out transformers. They chew on wires, enter buildings, and build nests in attics and chimneys. 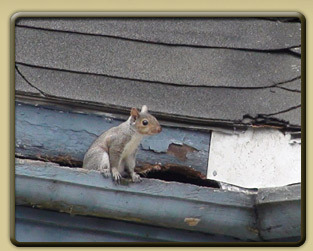 Once the Squirrel has entered your property, not only does the Squirrel need to be removed but the point of entry must be determined and properly sealed preventing a return visit. Squirrels \ ' skwe-rel \ Part of the rodent family. With 1659 species, it is the largest group of living mammals. Squirrels have two litters a year, the first between February and April and the second in August or September. The period of gestation varies from 33 days in the smaller species, up to 60 days for the larger. After mating the female drives the males away and raises the two to five young by herself. They are weaned at ten to twelve weeks. The spring litter is usually driven away by the mother shortly after weaning and as the next breeding cycle begins. The fall litter may stay with the mother in the nest through the winter until well after the winter courtship season.